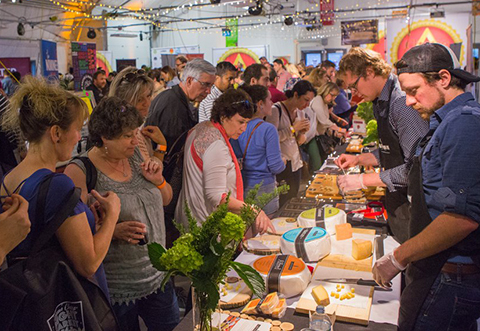 Housed in Picton’s Crystal Palace, The Great Canadian Cheese Festival (TGCCF) gathers together many of the Country’s best cheesemakers and artisan food producers each June for two full days of meeting, tasting, buying and learning. Now in its sixth year, TGCCF has become the biggest artisan cheese show in North America, with over 130 exhibitors and vendors offering hundreds of artisan foods products, including over 150 cow, sheep, goat and water buffalo milk cheeses, plus wine, cider and craft beer, pickles, jams, honey, charcuterie, and more. Make sure to visit the dairy farm displays and animals to thank them for all the great milk! 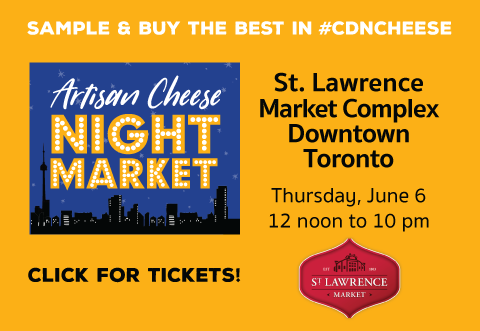 The Great Canadian Cheese Festival (TGCCF) is the place to taste and buy award winners from The Canadian Cheese Grand Prix and The Canadian Cheese Awards. Don’t miss our cheese tasting pairing seminars, cooking seminars and chef competitions at the festival. There are also a number of great events – cooking classes, farm-to-fork-meals and more happening before and around the festival. We encourage you to extend your stay. You are, after all, in Prince Edward County – one of Ontario’s great wine regions – home to 35+ wineries. Prefer cider and ale? – follow the self-guided Bay of Quinte Region Cheddar and Ale Trail. Or explore the historic small towns along the Loyalist Parkway, to Kingston and the 1,000 Islands. THIS YEAR’S EXHIBITORS . . .